Development and Peace has been involved in Ecuador since the 1970s and provides support for Indigenous groups, particularly Indigenous women as they form one of the most vulnerable segments of the population, human rights groups, and small family farmers, so as to encourage greater food sovereignty. Ecuador is one Latin America’s most disaster-prone countries. This vulnerability is due to geological hazards, including the risk of earthquakes, tsunamis and volcanic eruptions, along with climate risks, such as floods, landslides and droughts. 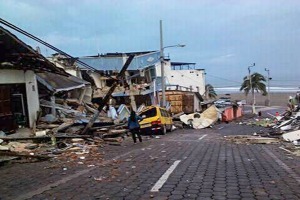 On April 16, 2016, a violent earthquake measuring 7.8 on the Richter scale hit the country, mainly affecting the northwest coast, approximately 170 km from Quito, the nation’s capital. Development and Peace immediately allocated $50,000 to support emergency relief efforts undertaken by its partners. Ecuador is one of the smallest countries in Latin America. Colombia lies to the northeast; Peru is located to the east and south; and the Pacific Ocean lies to the west of the country. Its economy is largely based on oil production. Ecuador is exposed to extreme meteorological phenomena such as volcanic eruptions, earthquakes, droughts and floods. Climate change is therefore a great source of concern for many Ecuadorians, including Indigenous communities, who produce a significant share of the country’s food supply. More than 20% of the population live below the poverty line, with rural communities, Indigenous groups, and women most affected by poverty. Development and Peace – Caritas Canada is closely monitoring the situation in Ecuador after a violent earthquake measuring 7.8 on the Richter scale, struck the country on Saturday April 16, 2016.